Anticipating German efforts to capture the government, the entire Norwegian parliament (the Storting) the royal family, and cabinet hastily evacuated Oslo by train and car to Hamar and then on to Elverum, where an extraordinary session of parliament was called. In large part because of the presence of mind of the parliament's president C. J. Hambro, the Storting managed to pass an emergency measure (known as the Elverum Authorization) that gave full authority to the king and his cabinet until the Storting could convene again. Norwegian spotters aided in the destruction of numerous German warships, such as the battleships Bismarck and Tirpitz. The Norwegian resistance also smuggled people in and out of Norway during the war, through Sweden or by fishing boats to Shetland, nicknamed the "Shetland bus". A number of saboteurs, most notably Max Manus and Gunnar Sønsteby, destroyed ships and supplies. Perhaps its most famous achievements were a series of operations to destroy Norsk Hydro's heavy water plant and stockpile of heavy water at Vemork, crippling the German nuclear programme. The Germans attempted to stifle Resistance activities and executed several innocent Norwegian men, women, and children in retaliation after any Resistance act. Probably the worst act of reprisal was the assault on the fishing village of Telavåg in the spring of 1942. 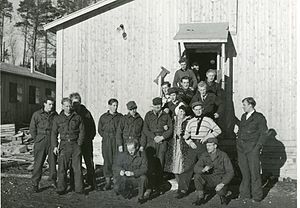 During the Liberation of Finnmark from 1944-1945, 1,442 police troops from Sweden would be flown in to assist the Soviets and Free Norwegian Forces. In addition to forces brought in from abroad, local troops were also recruited. During the war years, the resistance movement in occupied Norway had 1433 members killed, of whom 255 were women. ^ "War Memories of Devonshire". Royal Navy Memories. 2009-07-02. Retrieved 2017-01-15. ^ "Søndagen dei aldri gløymer" (in Norwegian). Bergens Tidende. 26 April 2002. Retrieved 14 March 2017. ^ Oddleiv Lygre (26 April 2002). "Telavåg-barnas grufulle minner" (in Norwegian). Bergens Tidende. Retrieved 14 March 2017. ^ Monsen, Kurt. Police units in Sweden: Norwegian resistance Page 1. Accessed April 3, 2010. ^ Borgersrud, Lars (1995). "Osvald-gruppen". In Hans Fredrik Dahl (ed.). Norsk krigsleksikon 1940-45 (in Norwegian). Oslo: Cappelen. ISBN 82-02-14138-9. Retrieved 15 September 2008. ^ Dahl, Hans Fredrik, ed. (1995). "tap". Norsk krigsleksikon 1940-45 (in Norwegian). Oslo: Cappelen. pp. 414–415. ISBN 8202141389. Retrieved 6 June 2015. Norwegian government (1998). "NOU 1998.12: Alta bataljon (aka "The Eitinger Report") - section 11.6.2: Sivorg". Norges offentlige utredninger (in Norwegian). Lovell, Stanley P. (1963), Of Spies and Stratagems, New York: Prentice Hall.